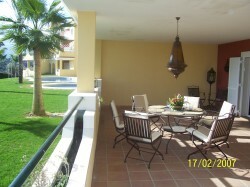 Poolside apartment (ground floor) with large terraces off lounge & bedrooms. 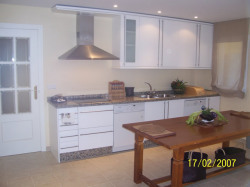 Location: next door to La Canada Golf, Sotogrande, Southern Spain. Groups & families welcome; Ideal for beach, golf & sight seeing holidays in Andalucia & Cadiz; large sunny terraces with dining table & BBQ; bedroom & kitchen terraces. 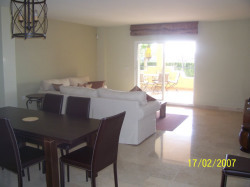 Extremely large kitchen with dining table & chairs - fully equipped to the highest standard (everything you need!!). Within a few minutes drive you will find, Sotogrande's exclusive Marina, the Polo Ground, San Roque, Alcaidasia & Valderrama golf courses. Marbella's lovely shops and beach front, Puerto Banus yatch marina, restaurants, bars & Night Clubs are just a 20 minutes drive. Culture and history can be found in the cities of Cadiz, Codoba, Estepona, Granada, Jerez, Seville, Malaga.